So, I went to the Grand to see a movie tonight. I didn’t get to do so. My plan was to use my MoviePass card; my buddy Dave Ramsey encouraged our family to get a budget on paper, and this month didn’t include any more movies. Thanks to MoviePass, I went home while the other seven people in our party went in. The cryptic message above leads me to believe that MoviePass has started to ration how many tickets it’ll allow at any given theater at any given time. That isn’t the agreement I signed up for in Fall of 2017. I’ve heard of them doing all kinds of funky stuff lately, from tracking a person’s movements before and after a movie to changing the number of movies a person can see with the subscription. They’ve gone back and forth on some of these things, but they’re clearly messing with the terms of the service. By the way, I decided to search by the movie (“Solo”, we’re nerds) instead of by theater to see if that would work. Nope. 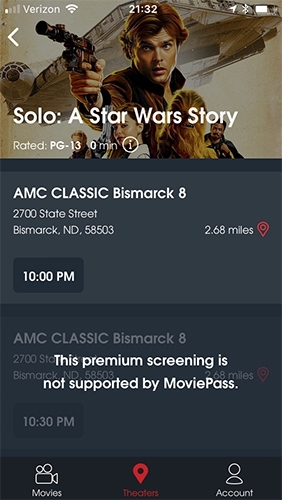 And, in fact, the app wouldn’t let me buy a ticket for that movie at the AMC theater across the way (as if I’d want to see a movie in a mall theater anyway, when we’ve got the awesome Grand Theaters). So there’s clearly another game afoot. I’d heard rumors that the service was going to selectively choose which movies it’d promote in some markets, presumably as a way to “encourage” the studios to buy-in to working with the service. Now it’s affecting us here in Bismarck-Mandan. It looks like I was mistaken on this part: the showings which were not supported were probably 3D, but I checked again the next morning to find that 2D showings were available. 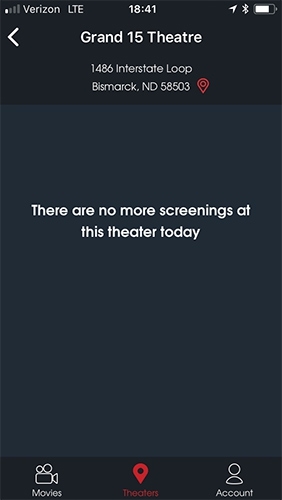 I’d heard that MoviePass had blocked other movies in some markets, and jumped to conclusions. I was an early adopter of MoviePass in its $9.99 iteration, and an evangelist to boot. Now, I’m ready to cancel my subscription and advise against signing up for the service. If you can arrive at a movie, MoviePass in hand, only to find out that it won’t allow you to purchase a ticket, you can end up like me with your evening plans dashed. I can’t recommend a service like that. Early on, company CEO Mitch Lowe said that they were targeting people like me, who only see a movie theater 1-3 times a year. Even if we triple our movie consumption with a MoviePass card, seeing 3-9 movies a year, they come out ahead. And let’s face it, 9 movies a year worth seeing is giving Hollywood way more credit than they deserve. But hey, it looked like a decent way to see a movie even if I don’t have any cash in my pocket at the moment, and I could always make sure I see at least a movie a month so I can feel like I’m getting my money’s worth. Well, that was conditional on the card and app working when I show up at the ticket counter. Since that’s now a gamble, and our family has a bona fide budget that even Dave Ramsey will be proud of, why don’t I just budget for a movie or two each month and call it good? Then I won’t have the uncertainty of MoviePass to contend with. I’ve put in a support request with MoviePass to see if I can get an explanation. Even so, I think I’m just going to cut out the uncertainty and set aside money for tickets to the movies I anticipate wanting to see. I’ve looked ahead at the list of upcoming movie releases for 2018, and I can find maybe six movies that I’d rather see on a big screen instead of waiting for Redbox. Even a couple of those are questionable…why not see them for a lot less money on the 60″ 4K TV in my home, with much more comfort and cheaper concessions? And I won’t get turned away at the last minute; reserving a Redbox movie doesn’t have to be done within a geofenced area near the machine, and it guarantees I’ll be able to get the movie instead of sulking home empty-handed as I did tonight. If you’ve been considering a MoviePass subscription, you might want to hold off until they get some more stability. If you’ve already got one, I hope your experience has been better than mine. I told every friend I knew about how great the service was when it worked, and even explained that I hadn’t experienced any weird issues that the Internet was buzzing about. But now, with local proof that the service may not be what it promised, I’m one step away from walking away from it forever.